1st +0 +2 +2 +2 Bonus feat, flurry of blows, stunning fist, unarmed strike –1/–1 1d6 +0 +0 ft.
2nd +1 +3 +3 +3 Bonus feat, evasion +0/+0 1d6 +0 +0 ft.
3rd +2 +3 +3 +3 Fast movement, maneuver training, still mind +1/+1 1d6 +0 +10 ft.
4th +3 +4 +4 +4 Ki pool (magic), slow fall 20 ft. +2/+2 1d8 +1 +10 ft.
5th +3 +4 +4 +4 High jump, purity of body +3/+3 1d8 +1 +10 ft.
6th +4 +5 +5 +5 Bonus feat, slow fall 30 ft. +4/+4/–1 1d8 +1 +20 ft.
7th +5 +5 +5 +5 Ki pool (cold iron/silver), wholeness of body +5/+5/+0 1d8 +1 +20 ft.
10th +7/+2 +7 +7 +7 Bonus feat, Ki pool (lawful), slow fall 50 ft. +8/+8/+3/+3 1d10 +2 +30 ft.
11th +8/+3 +7 +7 +7 Diamond body +9/+9/+4/+4/–1 1d10 +2 +30 ft.
12th +9/+4 +8 +8 +8 Abundant step, slow fall 60 ft. +10/+10/+5/+5/+0 2d6 +3 +40 ft.
14th +10/+5 +9 +9 +9 Bonus feat, slow fall 70 ft. +12/+12/+7/+7/+2 2d6 +3 +40 ft.
16th +12/+7/+2 +10 +10 +10 Ki pool (adamantine), slow fall 80 ft. +14/+14/+9/+9/+4/+4/–1 2d8 +4 +50 ft.
17th +12/+7/+2 +10 +10 +10 Timeless body, tongue of the sun and moon +15/+15/+10/+10/+5/+5/+0 2d8 +4 +50 ft.
18th +13/+8/+3 +11 +11 +11 Bonus feat, slow fall 90 ft. +16/+16/+11/+11/+6/+6/+1 2d8 +4 +60 ft.
20th +15/+10/+5 +12 +12 +12 Perfect self, slow fall any distance +18/+18/+13/+13/+8/+8/+3 2d10 +5 +60 ft.
Are you instead looking for the unchained monk? You’ll find it here. Monks are proficient with the brass knuckles, cestus, club, crossbow (light or heavy), dagger, handaxe, javelin, kama, nunchaku, quarterstaff, sai, shortspear, short sword, shuriken, siangham, sling, spear and temple sword. Armor and Shield Proficiency: Monks are not proficient with any armor or shields. When wearing armor, using a shield, or carrying a medium or heavy load, a monk loses his AC bonus, as well as his fast movement and flurry of blows abilities. The monk rules for flurry of blows state: “For the purpose of these attacks, the monk’s base attack bonus is equal to his monk level.” How does this interact with BAB from class levels and racial Hit Dice? Does a multiclassed fighter 19/monk 1 flurry as if his BAB were only +1? So a fighter 19/monk 1 has a normal BAB of +19. When he flurries, he treats his monk BAB as +1 (for his 1 level of monk) and still gets BAB +19 from his fighter levels, for a total flurry BAB of +20. When I use flurry of blows, can I make all of the attacks with just one weapon, or do I have to use two, as implied by the ability functioning similarly to Two-Weapon Fighting? You can make all of your attacks with a single monk weapon. Alternatively, you can replace any number of these attacks with an unarmed strike. This FAQ specifically changes a previous ruling made in the blog concerning this issue. Starting at 1st level, a monk can make a flurry of blows as a full-attack action. When doing so, he may make one additional attack, taking a –2 penalty on all of his attack rolls, as if using the Two-Weapon Fighting feat. These attacks can be any combination of unarmed strikes and attacks with a monk special weapon (he does not need to use two weapons to utilize this ability). At 1st level, a monk gains Improved Unarmed Strike as a bonus feat. A monk’s attacks may be with fist, elbows, knees, and feet. This means that a monk may make unarmed strikes with his hands full. There is no such thing as an off-hand attack for a monk striking unarmed. A monk may thus apply his full Strength bonus on damage rolls for all his unarmed strikes. Usually a monk’s unarmed strikes deal lethal damage, but he can choose to deal nonlethal damage instead with no penalty on his attack roll. He has the same choice to deal lethal or nonlethal damage while grappling. A monk also deals more damage with his unarmed strikes than a normal person would, as shown above on Table: Monk. The unarmed damage values listed on Table: Monk are for Medium monks. A Small monk deals less damage than the amount given there with his unarmed attacks, while a Large monk deals more damage; see Table: Small or Large Monk Unarmed Damage. At 1st level, the monk gains Stunning Fist as a bonus feat, even if he does not meet the prerequisites. The monk may attempt a stunning attack a number of times per day equal to his monk level, plus one more time per day for every four levels he has in classes other than monk. At 4th level, he can choose to make the target fatigued. At 8th level, he can make the target sickened for 1 minute. At 20th level, he can paralyze the target for 1d6+1 rounds. The monk must choose which condition will apply before the attack roll is made. These effects do not stack with themselves (a creature sickened by Stunning Fist cannot become nauseated if hit by Stunning Fist again), but additional hits do increase the duration. At 2nd level or higher, a monk can avoid damage from many area-effect attacks. If a monk makes a successful Reflex saving throw against an attack that normally deals half damage on a successful save, he instead takes no damage. Evasion can be used only if a monk is wearing light armor or no armor. A helpless monk does not gain the benefit of evasion. A monk of 3rd level or higher gains a +2 bonus on saving throws against enchantment spells and effects. At 4th level, a monk gains a pool of ki points, supernatural energy he can use to accomplish amazing feats. The number of points in a monk’s ki pool is equal to 1/2 his monk level + his Wisdom modifier. As long as he has at least 1 point in his ki pool, he can make a ki strike. At 4th level, ki strike allows his unarmed attacks to be treated as magic weapons for the purpose of overcoming damage reduction. At 4th level or higher, a monk within arm’s reach of a wall can use it to slow his descent. When first gaining this ability, he takes damage as if the fall were 20 feet shorter than it actually is. The monk’s ability to slow his fall (that is, to reduce the effective distance of the fall when next to a wall) improves with his monk level until at 20th level he can use a nearby wall to slow his descent and fall any distance without harm. At 12th level or higher, a monk can slip magically between spaces, as if using the spell dimension door. Using this ability is a move action that consumes 2 points from his ki pool. His caster level for this effect is equal to his monk level. He cannot take other creatures with him when he uses this ability. Starting at 15th level, a monk can set up vibrations within the body of another creature that can thereafter be fatal if the monk so desires. He can use this quivering palm attack once per day, and he must announce his intent before making his attack roll. Creatures immune to critical hits cannot be affected. Otherwise, if the monk strikes successfully and the target takes damage from the blow, the quivering palm attack succeeds. Thereafter, the monk can try to slay the victim at any later time, as long as the attempt is made within a number of days equal to his monk level. To make such an attempt, the monk merely wills the target to die (a free action), and unless the target makes a Fortitude saving throw (DC 10 + 1/2 the monk’s level + the monk’s Wis modifier), it dies. If the saving throw is successful, the target is no longer in danger from that particular quivering palm attack, but it may still be affected by another one at a later time. A monk can have no more than 1 quivering palm in effect at one time. If a monk uses quivering palm while another is still in effect, the previous effect is negated. At 19th level, a monk gains the ability to assume an ethereal state for 1 minute as though using the spell etherealness. Using this ability is a move action that consumes 3 points from his ki pool. This ability only affects the monk and cannot be used to make other creatures ethereal. At 20th level, a monk becomes a magical creature. He is forevermore treated as an outsider rather than as a humanoid (or whatever the monk’s creature type was) for the purpose of spells and magical effects. 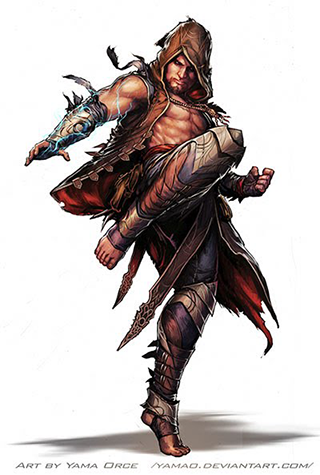 Additionally, the monk gains damage reduction 10/chaotic, which allows him to ignore the first 10 points of damage from any attack made by a nonchaotic weapon or by any natural attack made by a creature that doesn’t have similar damage reduction. Unlike other outsiders, the monk can still be brought back from the dead as if he were a member of his previous creature type. Instead of receiving an additional skill rank or hit point whenever they gain a level in a favored class, some races have the option of choosing from a number of other bonuses, depending upon their favored classes. The following options are available to the listed race who have monk as their favored class, and unless otherwise stated, the bonus applies each time you select the listed favored class reward.